All of my blogs that uses WordPress are linked to my WordPress.com account, even though I’m not hosted there anymore. By linking my sites to my account, I can use all the cool features, such as the newly launched enhanced stats! To see yours (only for WordPress blogs), log into your dashboard, go to Jetpack (if you have it installed), and click on Site Stats. Then, click on the Check it out now button and log into your WordPress.com account. 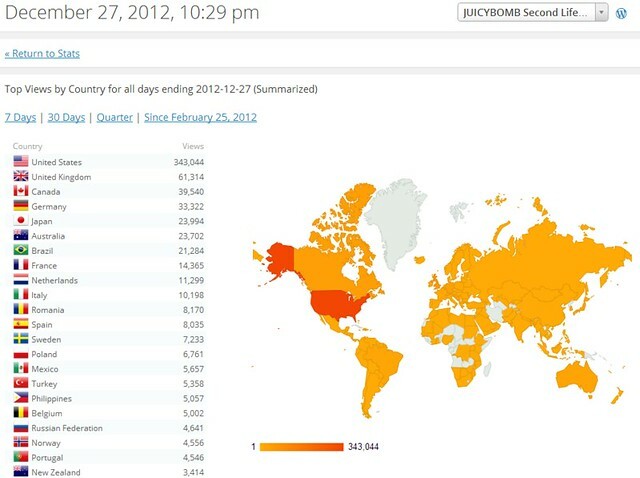 I love that JuicyBomb readers come from all over the world! Almost! The top 7 countries are United States, United Kingdom, Canada, Germany, Japan, Australia, and Brazil. Hello, Hallo, もしもし, Olá, Bonjour! Hey i am here to 😛 yay Aussie Aussie Aussie!